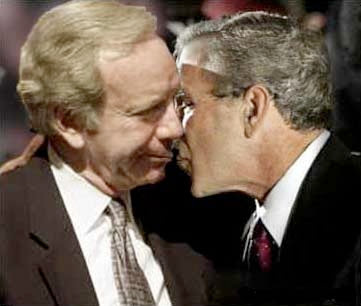 ...this it is simply yet another example of the ever accommodating Senator Joe Lieberman (Independent from Connecticut, aka Bush Toady) acting in a completely compromised, 'bi-partisan' manner to cover this George W. Bush's many exposures. Too bad he isn't willing to make any effort to work similarly with his former 'friends' in the Democratic Party. Sen. Joe Lieberman praises pastor who said Holocaust was God's work! One of John McCain's most prominent supporters on Tuesday praised an evangelical leader whom the Republican presidential candidate repudiated after a string of controversial remarks were made public. "The G.S.E.s are curious, because there’s no obvious reason for them to exist in the form they do: instead of creating private companies to do all these jobs, the government could just do them itself. In fact, that’s how Fannie Mae got started, back in 1938: originally, it was a government agency endowed with the authority to buy mortgages, in the hope that this would expand the supply of credit to homeowners. It wasn’t until 1968 that Fannie was privatized. … The main reason for the change was surprisingly mundane: accounting. At the time, Lyndon Johnson was concerned about the effect of the Vietnam War on the federal budget. Making Fannie Mae private moved its liabilities off the government’s books, even if, as the recent crisis made clear, the U.S. was still responsible for those debts. It was a bit like what Enron did thirty years later, when it used ’special-purpose entities’ to move liabilities off its balance sheet." From today's Wall Street Journal! There are many reasons why the Federal Reserve is boxed in on monetary policy, but Rep. Barney Frank Wednesday found a new dimension to the central bank’s dilemma. It’s a widely held view that Chairman Ben Bernanke and his fellow policy makers are facing a worrisome mix of tepid growth, troubled financial conditions and rising price pressures, with few attractive options for fixing this toxic environment. The weak economy and market tumult call for rate cuts. But the energy-driven price gains and deteriorating expectations for future prices call for rate increases. That’s left the Fed stuck at its current rate of 2%, very likely for an extended period. But according to Frank, if the U.S. social safety net weren’t so miserly, the Fed might actually have more room to take on inflation. In response to testimony on the economy by Bernanke Wednesday, the Massachusetts Democrat said current conditions suggest “we have reached a limit” on what the Fed can do with interest rates. He acknowledged arguments on both sides of the rate change calculus. But perhaps more importantly, he reckoned the Fed is now losing some of its ability to get inflation under control because it would cause a politically unpalatable worsening in already bad economic conditions. “The relative insufficiency of our social safety net vis-a-vis what you have in Western Europe constrains monetary policy,” Frank said. If the U.S. offered more support for the unemployed and displaced, “the Federal Reserve would then be freer…to slow down the economy in the knowledge this would not have a disproportionately negative effect” on the working population. That part of the population is already losing notable ground in economic terms, he said. Frank’s point went to the short-term trade off that monetary policy makers always face. Rate increases aimed at quelling inflation do the deed by slowing the economy. But growth is already teetering, and the economy has lost half a million jobs thus far this year. Rate increases now come with prospect of real economic pain. But on a longer-term horizon, most policymakers agree that if inflation isn’t controlled, sustainable growth, including job creation, is hard to achieve. That discomfort has already led to an unusual level of discord in the public comments of officials. Dallas Fed President Richard Fisher has opposed all of the Fed’s rate cuts this year. At the late June policy meeting Fisher thought the Fed should raise rates when the committee as a whole reckoned rates should stay fixed. In a speech last spring, Fisher flagged the difficult choice that may need to be faced. “Containing inflation is the purpose of the ship I crew for, and if a temporary economic slowdown is what we must endure while we achieve that purpose, then it is, in my opinion, a burden we must bear, however politically inconvenient,” he said on March 4. Economists are unsure what exactly would have to happen with inflation to change the Fed’s current stance of steady rates. But if things stay as they are, the Fed faces a difficult choice. ...put in power by oil company interests in the early 20th Century. ...that would be kinda like calling America 'Bushlandia'. Are you ready for four more years of Bush league politics? The number of people out of work for more than six months has shot up by 37 percent since June of 2007, according to the Bureau of Labor Statistics. Bankruptcy filings in the U.S. during the month rose 33 percent from a year earlier and may surpass 1 million in a year for the first time since bankruptcy laws were tightened in October 2005.